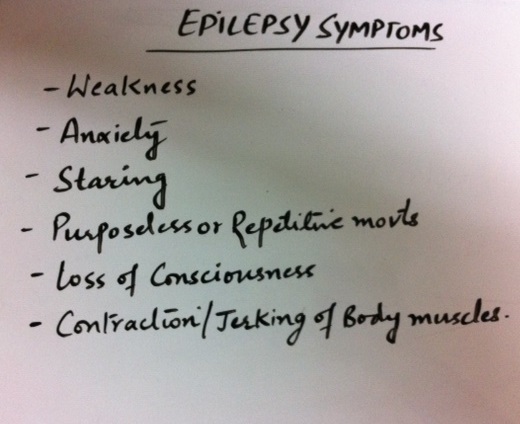 Symptoms of epilepsy differs from person to person. In some people there is simple staring while others have violent shaking or loss of consciousness. Seizure type mainly depends on the part of brain affected and the cause of epilepsy. In some people ,there is stage called “AURA” in which person have strange sensation like tingling sensation or emotional changes occur before actual seizure. It is commonly called as absence seizure. It occurs in people under 20 years of age. This type of seizure occur mainly for few seconds and involve staring or absence spells. These episodes occur many times a day. During this seizure there is difficulty in learning and lack of attention should be noticed . Person stop walking, find difficulty in mid- sentence and then start again few seconds later. During these seizure, person does not fall. There is change in muscle activity like fluttering eyelids, lip smacking, hand fumbling etc, change in alertness or consciousness is there . Seizure may be triggered by hyper ventilation or flashing lights in some cases, but after the seizure person awake, think properly and unaware of seizure. During this seizure whole body is involved. It is also known as GRAND MAL SEIZURE. These type of seizure occurs at any age. During this there is muscle rigidity which is followed by muscle contraction and loss of consciousness . There may be biting of tongue, clenched teeth or jaw, there is incontinence of urine and stool. There is difficulty in breathing. Sometime there is blue color of skin occurs. After the seizure person have normal breathing , severe headache, drowsiness. Person feel sleepy for 1 hour or there is loss of memory of events during seizure episodes.Person is confused after the episode. There is weakness of one side of body after seizure for few minutes to few hours. It is called as TODD’s PARALYSIS. Focal seizures occurs in specific part of brain and in this electrical activity is limited to area of brain. Partial seizures can be classified into simple or complex. In simple seizure memory is not affected but in complex memory is affected before, during and immediately after the seizure. Patient with focal seizure does not lose consciousness During this there is abnormal muscle contraction or relaxation takes place. There is also abnormal movements of mouth, lip smacking, turning of eyes . Abnormal sensations like numbness, tingling etc can occur. Other symptoms include hallucinations, sweating, flushed face, increased heart rate, dilated pupils, black out spells, change in emotions etc.